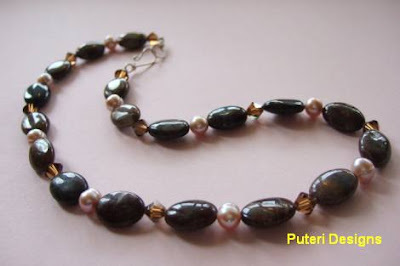 Pearls, crystals and oval shaped Pietersite. 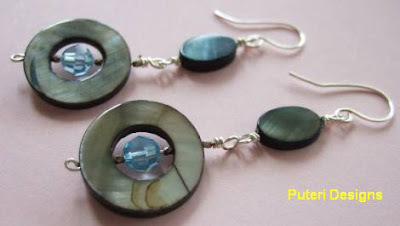 Mother of pearl, and blue zircon crystals. Green mother of pearl and olive crystals. 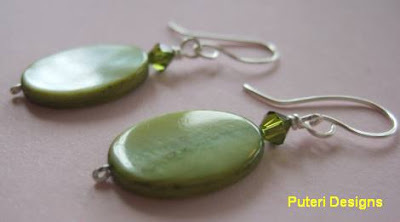 Dear, how much do u normally charge for this dangling earrings. Lovely@!! Depending on the materials used, they range from 8 - 15 USD. :-) Enti ba Malaysia din, different market, engka bisi murah mimit! 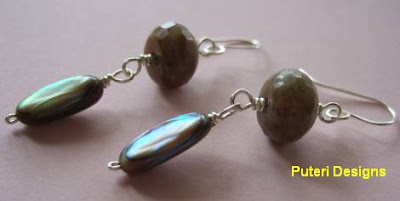 I only use natural stones, sterling silver, fresh water pearls and swarovski crystals with my creations. No plastic! wow!! dear,you make a nice pieces here.Do you have special order or just sell it when your customer see it?..Btw,I just bought another domain for my health blog.hop over,what do you think? lesley, i haven't sold many. I like my pieces too much to put them up for sale! hehe!